The event included EAST FORUM 2018, the annual meeting of the European Academy of Surface Technology. Organised by CIDETEC Surface Engineering, the 32nd International Conference on Surface Modification Technologies gathered together the leading international agents and reference institutions at Donostia Technological Park to promote and spread advances in these disciplines and facilitate the establishment of collaboration channels between scientists and engineers in all the fields related to this activity. 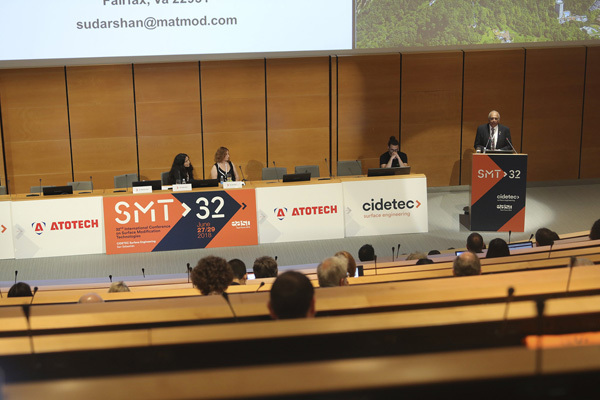 Held from 27 to 29 June, the conference finished a programme that included 5 plenary talks, 82 oral presentations and 25 posters in a total of 10 sessions. On concluding, the conference granted the prize for the best poster to Dr Natalia Tintaru of Vilnius University, Lithuania. On its side, the European Academy of Surface Technology awarded the 2018 EAST-Schwäbisch Gmünd Prize to Dr Nhat Truong Nguyen of Erlangen-Nuremberg University, Germany, who gave a talk entitled Thermal dewetting of noble metals on anodic TiO2 nanotubes leads to significantly enhanced photocatalytic H2 generation. Several social events took place during the conference, to the benefit of closer ties between the participants. Among these events, the welcome party given at the San Sebastián Aquarium and the gala dinner held at Miramar Palace were to be underscored.